To describe a case of persistent hypothermia following spinal anesthesia with intrathecal morphine. Following elective right total knee arthroplasty under spinal anesthesia with isobaric 0.5% bupivacaine 11 mg, fentanyl 15 μg, and preservative-free morphine 150 μg, a 57-yr-old female (93.5 kg, 151 cm) developed postoperative hypothermia with a nadir rectal temperature of 33.6°C four hours after surgery. At times, her temperature could not be measured by tympanic, temporal arterial, oral, axillary, or rectal routes. In spite of the low temperature, the patient complained of feeling hot and was diaphoretic without shivering. With the exception of her temperature, her vital signs were normal postoperatively, and aside from hyperglycemia, complete blood count, electrolytes, thyroid-stimulating hormone, serum cortisol, troponin, and twelve-lead electrocardiogram were normal. Her temperature did not respond to warming efforts with a forced-air warming blanket, infusion of warmed intravenous crystalloid, and hourly bladder irrigation with warm saline through an indwelling urinary catheter. Normothermia returned after she received a small dose of sublingual lorazepam eight hours after surgery. The remainder of her postoperative stay was uneventful. Patients undergoing spinal anesthesia with intrathecal morphine may develop postoperative hypothermia that is resistant to warming measures. This complication may be treated successfully with lorazepam. Kenneth Ryan conducted the literature review, wrote the first draft of the case report, and contributed to the revisions of the manuscript. James Price was involved in the care of the patient and contributed extensively to the revisions of the manuscript. Brian Warriner was involved in the care of the patient and contributed extensively to the revisions of the manuscript. Peter Choi was involved in the care of the patient, obtained consent from the patient, conducted the literature review, and contributed extensively to the revisions of the manuscript. Décrire un cas d’hypothermie persistante après anesthésie médullaire avec administration intrathécale de morphine. Après arthroplastie totale programmée du genou droit sous anesthésie médullaire utilisant de la bupivacaïne 0,5 % isobare 11 mg, du fentanyl 15 μg et de la morphine 150 μg sans agent de conservation, une femme âgée de 57 ans (93,5 kg, 151 cm) a présenté une hypothermie postopératoire avec une température rectale descendant jusqu’à 33,6 °C quatre heures après l’opération. Par moment, sa température n’a pas pu être mesurée par voie tympanique, orale, axillaire, ou rectale, ou par le biais de l’artère temporale. En dépit de cette température basse, la patiente s’est plainte d’une sensation de chaleur et présentait une diaphorèse sans frissonnement. À l’exception de sa température, ses signes vitaux postopératoires étaient normaux et hormis une hyperglycémie, la formule sanguine complète, les électrolytes, l’hormone thyréotrope, le cortisol sérique, la troponine et un électrocardiogramme à 12 dérivations étaient normaux. Sa température n’a pas réagi aux efforts de réchauffement avec une couverture chauffante à ventilation forcée, une perfusion intraveineuse de cristalloïdes réchauffés et une irrigation vésicale de sérum physiologique chaud réalisée chaque heure au moyen d’une sonde urinaire à demeure. La patiente est redevenue normothermique huit heures après l’intervention après avoir reçu une petite dose sublinguale de lorazépam. Le reste de son hospitalisation postopératoire n’a été marquée par aucun événement particulier. Les patients subissant une anesthésie médullaire avec administration intrathécale de morphine peuvent développer une hypothermie postopératoire résistante aux mesures de réchauffement. Cette complication peut être traitée avec succès par du lorazépam. Intrathecal morphine is an analgesic commonly used in spinal anesthesia for a variety of surgical procedures. The advantages of intrathecal morphine include its opioid sparing effect in the postoperative period,1 targeted site of action in the central nervous system, and extended duration of action mediated by its effect on opioid receptors in the spinal cord.2 Intrathecal doses of morphine can also be associated with pruritis, urinary retention, nausea, and delayed respiratory depression.2,3 While hypothermia can be a common consequence of spinal anesthesia due to vasodilatation and the loss of the shivering reflex,4 several anecdotal reports describe persistent hypothermia in the obstetrical population after spinal anesthesia using intrathecal morphine.5-9 This case report describes persistent hypothermia following spinal anesthesia using intrathecal morphine for total knee arthroplasty and the return to normothermia after sublingual lorazepam. We obtained the patient’s written consent to publish this case report. A 57-yr-old Caucasian woman (93.5 kg, 151 cm) with a ten-year history of bilateral knee osteoarthritis underwent an elective right total knee arthroplasty at the University of British Columbia Hospital. The patient’s medical history included a long history of smoking, stable mild chronic airflow limitation without recent exacerbation, occasional gastroesophageal reflux, dyslipidemia, and morbid obesity (body mass index 41.5 kg·m−2). Her routine medications were oral diclofenac and rosuvastatin and inhaled fluticasone-salmeterol. Aside from postoperative nausea and vomiting, she had not experienced any adverse effects from her previous anesthetics (two general anesthetics and two spinal anesthetics). Details from her prior anesthetics were unavailable. On the morning of her surgery, the patient’s vital signs were normal (oxygen saturation [SpO2] 98%, respiratory rate [RR] 16 breaths·min−1, blood pressure [BP] 130/70 mmHg, oral temperature 36.6°C) except for a sinus bradycardia (heart rate [HR] 50 beats·min−1). Prior to anesthesia, she received cefazolin 2 g iv, oral acetaminophen 1,625 mg, oral ranitidine 150 mg, and inhaled nebulized salbutamol 2.5 mg. Upon arrival in the operating room, she received dexamethasone 4 mg iv and midazolam 1.5 mg iv. After application of standard anesthetic monitors and oxygen 8 L·min−1 via a face mask, we achieved spinal anesthesia with isobaric 0.5% bupivacaine 11 mg, fentanyl 15 μg, and preservative-free morphine 150 μg injected via a Quincke 22-G needle at the interspace between the third and fourth lumbar vertebrae. The patient was sedated with an intravenous infusion of propofol (average rate 100 μg·kg−1·min−1), and she received an intravenous infusion of room-temperature 0.9% saline 1,000 mL intraoperatively. Her routine vital signs were monitored with the exception of body temperature. Due to the speed of the surgeon, we used warmed blankets instead of a forced-air warming blanket to keep the patient warm. A tourniquet was applied above the operative site, inflated prior to incision, and deflated after skin closure. Intraoperative blood loss was negligible. The surgery was uneventful and the patient was transferred to the postanesthetic care unit (PACU) in stable condition. The total tourniquet, surgical, and intraoperative times were 45, 67, and 113 min, respectively. On arrival in the PACU, her initial postoperative vital signs were SpO2 99%, RR 14 breaths·min−1, HR 70 beats·min−1, BP 100/50 mmHg, and temporal arterial temperature 35.9°C. Sensation to temperature was blocked up to the T2 dermatome, and she was nauseous and diaphoretic. Her nausea resolved after one dose each of dimenhydrinate 25 mg iv and prochlorperazine 5 mg iv. She remained diaphoretic during her PACU stay. The PACU nurses could not measure her temporal arterial, oral, or axillary temperatures after the initial measurement, but the patient stated that she felt hot. She was transferred to the ward 2.5 hr after surgery when she met our PACU discharge criteria (with the exception of temperature). On the ward, the patient’s RR, HR, and BP remained normal. She was somnolent but was easily roused. Tympanic, temporal arterial, oral, and axillary temperatures could not be measured; rectal temperature was 34.1°C. Measurement of temperature remained difficult over the next five hours, and when measurable, rectal temperature fluctuated in the mid-33 to mid-34°C range with a nadir of 33.6°C four hours after surgery. In spite of the low temperature measurements, the patient remained diaphoretic without shivering and described feeling hot. Respiratory rate, HR, and BP remained normal. Aside from hyperglycemia (9.9 mmol·L−1), all other investigations (complete blood count, electrolytes, thyroid-stimulating hormone, serum cortisol, troponin, and twelve-lead electrocardiogram) were normal. We attempted to actively re-warm the patient using a forced-air warming blanket, an infusion of warmed intravenous crystalloid 1 L (via a fluid warmer) over an hour, and hourly bladder irrigation with warm saline through an indwelling urinary catheter. In spite of our attempts to re-warm the patient, we were eventually unable to measure her temperature using any route (tympanic, temporal arterial, oral, axillary, and rectal) eight hours after surgery. We could not identify a possible etiology for the hypothermia except intrathecal morphine. We avoided using naloxone to reverse the effects of the intrathecal morphine as we were concerned about antagonizing its analgesia. Using PubMed, we identified a case series describing hypothermia in parturients after Cesarean delivery under spinal anesthesia with intrathecal morphine.5 The authors suggested an association between lorazepam and the resolution of hypothermia.5 Based on this report, we administered sublingual lorazepam 0.5 mg to the patient. Within 25 min, the patient was no longer diaphoretic or feeling warm. Her temporal arterial temperature was 35.6°C, and it slowly increased to normal levels by the next morning. The remainder of her postoperative course was uneventful. 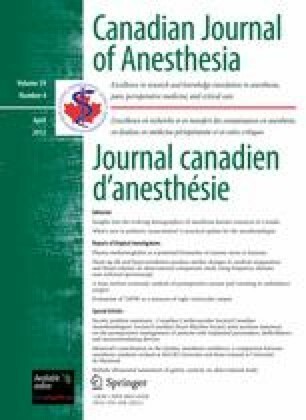 We describe a case of mild persistent postoperative hypothermia after spinal anesthesia using intrathecal morphine 150 μg in a patient undergoing total knee arthroplasty. Normal body temperature was measured after treatment with a small dose of sublingual lorazepam. While spinal anesthesia causes a drop in body temperature due to vasodilatation and a loss of the shivering reflex,4 the resulting hypothermia is usually treated successfully with external re-warming techniques, such as increasing the room temperature, provision of dry linens and gowns, and the use of forced-air warming blankets. In this case, other causes of perioperative hypothermia were considered as causes for this patient’s hypothermia, including low ambient room temperatures, cold intraoperative intravenous fluid administration, high spinal blockade, and a relatively small body-to-surface area ratio in this short-statured patient. After the resolution of the spinal sensory blockade, the maladaptive response of diaphoresis, the lack of shivering, and the failure of aggressive warming techniques suggested another cause. It is our view that intrathecal morphine was the cause of the persistent hypothermia and abnormal thermoregulatory response in our patient. Persistent hypothermia after spinal anesthesia with intrathecal morphine has been described in six other case reports of 20 patients (Table),5-9,11 and another case has been described in a non-obstetrical patient.11 All of the patients reported nausea and diaphoresis; a number of them complained of feeling hot, and none of them shivered or felt cold. The nadir of the temperature measurements ranged from 33.2°C (tympanic)9 to 34.9°C (mean oral).8 The duration of hypothermia varied widely (2-22 hr). The effect of morphine on thermoregulation is species-dependent, with morphine causing hyperthermia exclusively in some animals (e.g., rats)13 and hypothermia in others (e.g., dogs).14 Its effect on thermoregulation is also dose-dependent, with smaller doses causing hyperthermia and larger doses causing hypothermia.15 Results from these animal studies suggest that intrathecal morphine-induced hypothermia may be due to a central effect of morphine on the thermoregulatory centres in the hypothalamus. Morphine may play a role in hypothermia by altering the temperature set point in the hypothalamus. This may result in maladaptive changes, such as sweating and an absence of shivering that may exacerbate the hypothermia and contribute to the subjective sense of feeling warm, which is opposite to the effect of chills associated with a febrile patient.16-18 The mechanism for morphine’s effect on the hypothalamus has yet to be clearly defined. The dorsomedial hypothalamus has been identified as a location of thermoregulation in the brain. In rats, fentanyl acts through the dorsomedial hypothalamus and causes initiation of non-shivering thermogenesis by metabolism of brown fat. This is thought to be a stress response in rats. There are substantially more kappa receptors than mu receptors in the dorsomedial hypothalamus,21 and this difference may account for the greater efficacy of meperidine compared with morphine to abolish shivering. Perhaps an intrathecal dose of morphine could saturate receptors locally in the dorsomedial hypothalamus with a similar effect to meperidine. Morphine may also alter the temperature set point in the hypothalamus causing the body to feel hot and then sweat to adapt to the heat. A mechanism for this has not been described. In the anterior hypothalamus, morphine inhibits “cool-sensitive interneurons” via serotonin-secreting neurons and causes a decrease in metabolic heat production.22 Understanding the interplay of morphine’s effect on mu receptors in different parts of the hypothalamus may be the key to define the mechanism by which it causes hypothermia in humans. Hess et al. described a return (within 90 min) to normothermia in eight of the ten parturients who received lorazepam.8 We also observed a rapid increase in our patient’s body temperature. Lorazepam binds to benzodiazepine receptors, which are subunits of gamma-aminobutyric acid-A (GABAA) receptors, and enhances the effect of GABA on GABAA receptors. Although benzodiazepine receptors are found mostly in the cerebral cortex, they are also found in the hypothalamus. Binding of benzodiazepine receptors and its effect on GABA-related activity in the hypothalamus may modulate thermoregulation. The role of GABA receptors in thermoregulation is supported by animal studies in which the administration of GABAergic substances in the central nervous system (CNS) affects thermoregulation.23,24 In humans, it remains unclear whether GABA activity results in hyperthermia or hypothermia. Other investigators have reported hypothermia in patients receiving valproic acid, which is a GABA receptor agonist.25 The role of GABAergic substances in thermoregulation requires further elucidation. In summary, we observed persistent hypothermia in a patient after spinal anesthesia using intrathecal morphine. Normothermia returned after administration of lorazepam. The mechanisms by which morphine and lorazepam affect thermoregulation remain unclear. Information from manufacturers’ service manuals. Available from URL: http://www.exergen.com/medical/PDFs/TAT5000Manualr5-5rev-ecl.pdf and http://www.welchallyn.com/documents/Thermometry/Electronic%20Thermometry/SureTemp%20690/servicemanual_20070621_suretempplus.pdf (both accessed November 2011). We thank the patient for granting permission to publish this case report. We also thank Dr. Steven Sutcliffe and the nurses from the University of British Columbia Hospital PAR and the University of British Columbia Hospital Surgical Observation Unit for their care of the patient.